The SQL Server support team does get a lot of calls regarding slow performance which on analysis leads to a slow performing disk sub-system. 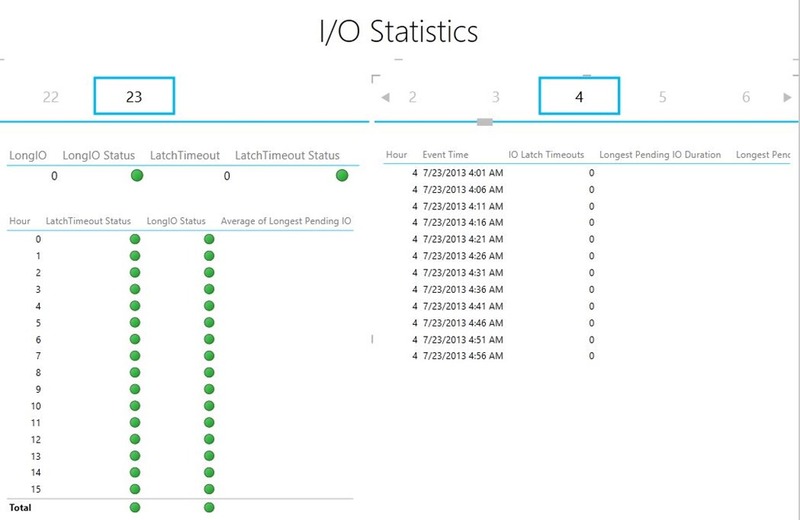 The IO_SUBSYSTEM component of the sp_server_diagnostics output in SQL Server 2012 tracks I/O related latch timeouts and long duration I/Os reported along with the filename and the longest pending I/O duration. This information can be very useful when looking at the trends of slow I/O reported on the SQL Server database files on an instance. As shown earlier in the series, I used this data captured by the sp_server_diagnostics output present in the System Health Session ring buffers to build visualizations using Power Pivot and Power View in Excel 2013. The query available at the bottom of this blog post allowed me to fetch the information from the System Health Session ring buffer into a Power Pivot table. After that I created a two calculated fields for Hour and Day using the Event Time field in the table. Then, I created two calculated fields for tracking the maximum number of Long IOs and IO Latch Timeouts reported. Then I assigned KPIs to each of these calculated fields. After that I got down to designing the Powershell sheet which finally looked like the image in the screenshot! The slider enables you to see the KPI status for each day on an hourly basis and the table on the right gives you insights into every snapshot captured by the sp_server_diagnostics output for the hour that you are interested in. SQL Server Memory has been always a topic of discussion at most client locations that I visit. So, I thought I will dedicate the third post of my Power View and System Health Session series to Memory usage. SQL Server 2012 instances tracks some very useful information with the help of the sp_server_diagnostics output. I will be concentrating my efforts on the RESOURCE component’s output. So get ready to have a plethora of information about your SQL Server instance’s memory usage available in a single Power View sheet in Excel 2013!